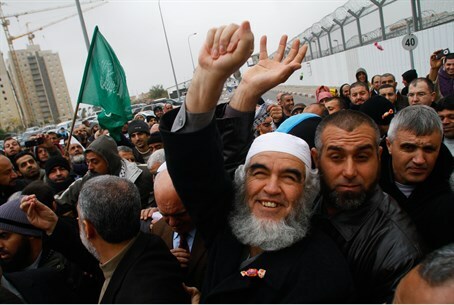 In response to the court announcement that his sentencing will take place March 26, Sheikh Raed Salah, head of the Islamic Movement in Israel, said that the arrest of Palestinian Arabs would not stop the disappearance of the "occupation." "If the ruling will order a period of arrest for months or years, it doesn't scare us, for we will always support Al-Quds (Jerusalem) and the Al-Aqsa Mosque (on the Temple Mount) in accordance with the oath and loyalty that will not be cut off until we meet Allah," Salah said. The Jerusalem District Court last November accepted the state's petition charging Salah with incitement to racism, in addition to the charge of incitement to violence he was convicted of in the magistrates court. However, the court didn't decide whether to make Salah's punishment more severe, returning the discussion on sentencing to the Jerusalem Magistrates Court. Salah was convicted by the Jerusalem Magistrates Court in November 2013 with inciting to violence, but acquitted on inciting to racism. Last March, he was given eight months of jail and an additional eight months on condition. The indictment against Salah relates to his calls to use violence to block Jews from visiting the Temple Mount, the holiest site in Judaism, calls to racism and violence that have led MKs to launch a bill to outlaw Salah's movement. Salah has labeled Israeli leaders “terrorists” and “enemies of Allah” in a speech to Muslims in Be’er Sheva, and was also jailed for five months in 2010 for spitting at an Israeli police officer.